The Breakfast Briefing is taking a short break for Christmas. There will be no morning newsletter on Thursday and Friday of this week. We'll be back on Monday morning. Image via SpaceX's Facebook page. Elon Musk’s SpaceX earned glowing media coverage on Monday night and Tuesday morning after it launched a rocket that delivered its payload, then safely returned to earth. 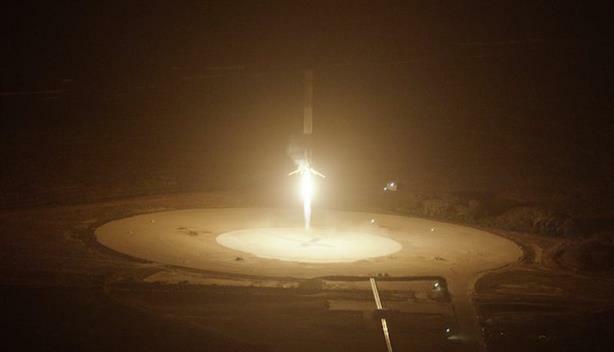 The 15-story Falcon 9 rocket landed just six miles from where it took off. Shares of Chipotle were down 3% on Monday afternoon after the Centers for Disease Control and Prevention said it is investigating another E. coli outbreak linked to its restaurants. The new incident is not connected to the October outbreak in the Pacific Northwest, the CDC said. John Podesta, chairman of Hillary Clinton’s campaign, isn’t backing down from her Saturday comments that the Islamic State is using Donald Trump in its recruiting. Podesta went on a Twitter spree on Monday evening defending her stance; Trump has demanded she apologize. Volkswagen executives looked at new emissions standards in California in 2007 and believed they would be "impossible" to comply with, according to an investigation by The New York Times. California’s standards introduced in the last decade were the country’s first of their kind. NYT: Hillary Clinton embraces Bill Clinton’s economic legacy; New York: Trump gets bored with Hillary feud, ratchets up the sexism; Reuters: Trump becomes poster boy for efforts to mobilize 2016 Latino voters; Politico: Talk radio rallies around Ted Cruz. A number of Silicon Valley heavyweights are expressing their opposition to a proposed UK law that would give the government greater ability to monitor communications. Apple CEO Tim Cook defended Apple’s privacy technology this Sunday on 60 Minutes. The Vatican promoted Greg Burke, a former correspondent for Fox News, to Pope Francis’ deputy spokesman. He has been working as a communications consultant at the Vatican since 2012. Burke will report to longtime Jesuit spokesman the Rev. Frederico Lombardi.